The Sustainable Couple: John ROCKED Valentine's Day. No one ever wonders why I married John. He's courteous to others. He's caring. He works with his hands. He puts others before himself. He's awkward in social situations. He also keeps his emotions to himself; I mean, the man never gets angry. And if he does get angry, you won't know it, because he's so even-tempered. He makes me look like a ragin' B who can't control the words that come out of my mouth when something rubs me the wrong way. I also love this man because he's thoughtful. 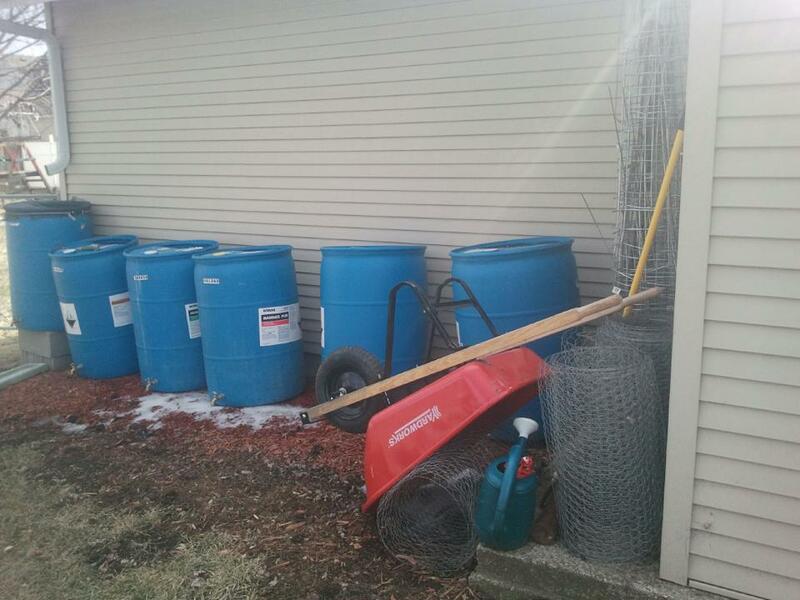 For example, this Valentine's Day, he made me six new rain barrels. I came home from work the other evening to find six barrels from the Kalona Cheese Factory in his garage. I knew what he had in mind. It made my heart flutter. And the next day I got this picture message from him. Yep. 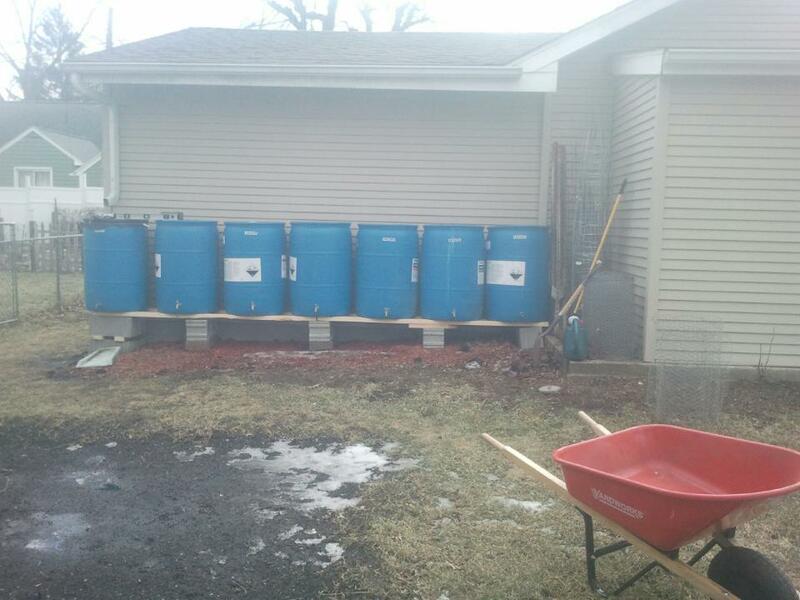 Six new rain barrels. And he didn't stop there! He began installing them in our backyard, near our large garden. Of course, he was texting me pictures of the progress all day. This made it even more special, because he knows that I like to be involved in projects like this. He had the thoughtfulness to send me pictures of the progress so I could feel like I was there - part of the action - but not have to do any legwork. This is something that I've wanted for over a year. I will admit, now that I see them all lined up, I don't know if I was a little overzealous with wanting that many rain barrels. It's kind of intimidating seeing all those guys lined up, ready for rainwater runoff. 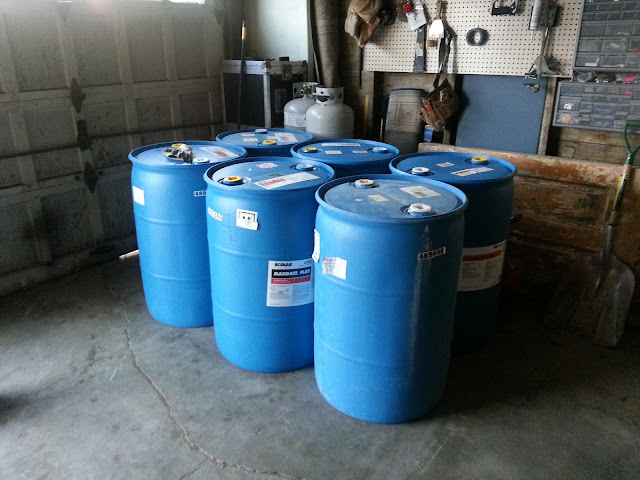 I know I'll use them all the time, and it will save us a lot of money during this summer's anticipated drought. It's also a bit of an eyesore. I need to think of something to conceal the blue-ness. Like a fence or lattice, with some climbing plants. That's a perfect spring project. Now I just need spring to arrive. Your hubbie is a keeper! We have a single rain barrel, same blue as yours. My honey painted ours black to eliminate the "blue-ness" factor and it looks much better (pictures on our blog @ http://taylormaderanch.com/blog/?p=347 ) He also installed a hand-pump on top and a spigot on the bottom so it's very useful for me. But to hide your barrels, maybe paint them black like we did or place lattice in front of them to hide? Just a couple of thoughts. We're on the same wave-length, Taylor-Made! I was talking with my parents over the weekend and my dad has a hand pump I can have (woo hoo! ), and we priced out two sheets of lattice at our hardware store, as well. I am not much of a flower gardener, so I need to do some research on a nice climbing plant that can grow up the lattice AND come back every year. I'd love to, Kathy! Thanks for the invite. Kelli, I had to laugh when I read this. For my Valentine's Day present, Brandon installed a task light in my sewing armoire. I was totally appreciative, but struggled a bit to see the romance in it, but oh well, what can you do? I think we both got pretty good ones :). I love it!! I would love rain barrels as well but instead we were just working on water drainage on the house so my husband ran tubing down along our planting areas that carries most of our run off. It does most of the watering for us but rain barrel is still on my list. Maybe I will have to mention that my husband can make it for me :) Valentines Day is also my birthday so I asked him to clean my Kitchen Aid (he does it with a toothpick and takes things apart which I don't have the patience for) and to fix some spots on the kitchen wall. I am super excited to say that I got both!! I love thoughtful gifts because when you have a quiet one that is the way that he tells you he loves you by doing something you really wanted (especially the weird things that other people don't listen to). It tells me much more than overpriced flowers, cards and chocolate :) I just found you from a link and I am your newest follower!! Your arrangement sounds practical for your situation. Go girl! I love the step-by-step instructions of this project. My husband and I are working towards paying down our debt in the next year while I finish up my degree. Once I graduate and land my "big girl" job it will be house buying time. We have been renting this adorable but tiny house in the city limits with no yard space and are so antsy to get out to the country with land. I have always had a garden and these last few years have been wanting a garden so bad. My sister is kind enough to allow me to help her dig in the dirt of her garden from time to time. 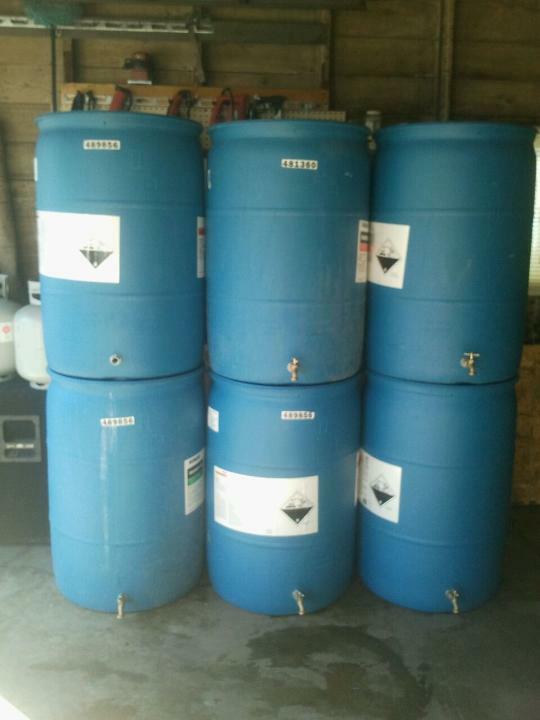 These rain barrels are definetely happening when we start our garden. I actually have a family member who has about ten of those big barrels outback of his barn and I am sure he would be happy if I took them off of his hands for him. Thanks again for sharing all of your adventures with us. You and your husband sound a lot like my husband and I. Can't wait to read more stuff about your experiences. It sounds like you have a plan - please let me know how everything goes. AND, thanks for reading!